Kenya’s Capital Markets Authority (CMA), has published a digest of legal cases that Authority has been involved in, and some of which were later appealed. The 27 cases cover ten years, and most the largest share involve dealings at Uchumi and others revolve around executives and directors of CMC, commercial banks, and a handful on rogue stockbrokers who preyed on retail investors during the heyday of the Nairobi Stock Exchange during the IPO listings of Kengen and Safaricom. Some notable cases include, Solomon Alubala who was fined Ksh 104.8 million and barred from holding a position at a listed firm for ten years, Bernard Mwangi who attended Uchumi board meetings and sold shares while the company was performing poorly, CMA cases versus Jeremiah Kiereini and Martin Foster, Chairman and CEO of CMC Motors, the CMA versus the Institute of Certified Public Accountants of Kenya (ICPAK) over audits done by its members at CMC, cases involving Chadwick Okumu, CFO of Uchumi, and CMA versus Jonathan Ciano, a CEO who was for a time celebrated for turning round the Uchumi. They also have a case of Alnashir Popat and Imperial Bank directors, and Munir Ahmed MD of National Bank who the CMA fined Kshs 5 million and barred from holding a position at a listed company for three years. The cases are published in partnership with the National Council for Law Reporting who have an online database of over 124,000 court cases. This entry was posted in CMA Kenya, CMC, Corporate governance, corruption, NSE IPO, NSE stockbrokers, Uchumi on November 24, 2018 by bankelele. On Thursday, November 8, the board and management of Cytonn Investment had a session with investors at the end of a weeklong series of meetings. 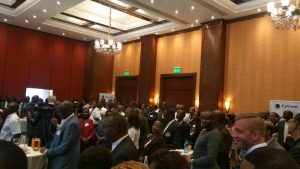 Present at the cocktail were managers and directors of different Cytonn companies, a few hundred of the 3,500 Cytonn investors and a team from principal partner Taaleri Africa. Prof. Daniel Mugendi, the Cytonn Chairman, spoke of East Africa’s attractiveness to investments as he thanked the management for the growing the relationship with Talleri, which had just resulted in them investing a further Kshs 2 billion in real estate projects with Cytonn as well an interest to buy 20% of Cytonn in an IPO, which the board supported. 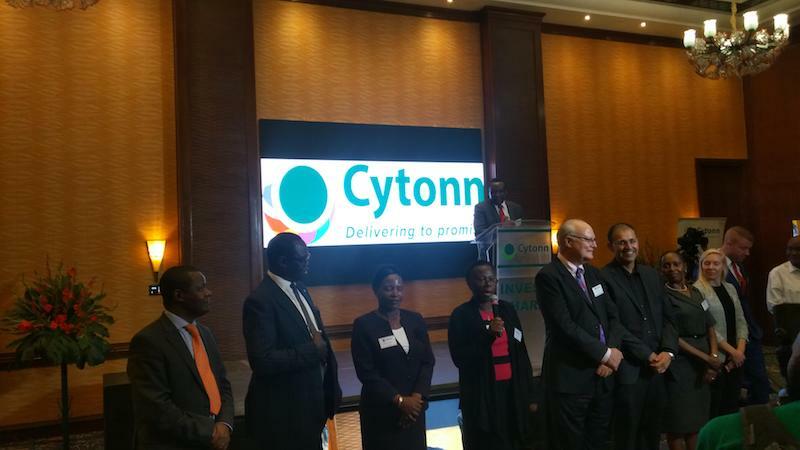 Cytonn has several arms including real estate, education, hospitality, asset management (Seriani and Cytonn Asset Managers are being merged next week), high yield solutions, and a diaspora office run from Washington DC. Edwin Dance, the CEO of Cytonn said that funds raised from investors (minimum Kshs 1 million) are primarily (~70%) put into the different real estate projects such as the Alma, Taraji, The Ridge, Newtown (1,000 acres) and RiverRun which are run as independent special purpose vehicles (SPV)] with their own boards and reporting structures. 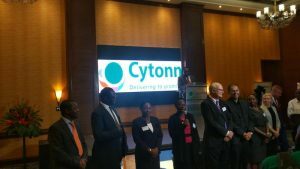 Dande said Talleri was the first institutional investor to commit to Cytonn as he also saluted some of the early investors and supporters of Cytonn, including the Chairman, who came on board even as its founders were embroiled in a bitter tangle with their former employers. Kati Salo, a risk specialist with the Taaleri Africa team said they had exited the Amara project successfully and were now back to do more investments with Cytonn and had signed with The Ridge, taking their investment to Kshs 5 billion. She added that they were impressed with the team who had also given them access to management, clients and advisors and had decided to take a stake in Cytonn in the planned listing of the company. Earlier this year, shareholders of Cytonn had approved a listing of the company, and going by the amended resolution, this may not necessarily be on the Nairobi Securities Exchange,GEMS segment. This entry was posted in Corporate governance, Cytonn, Kenya real estate, NSE investor awareness, NSE IPO on November 10, 2018 by bankelele. A dispute between insurance giant Britam and some of its former executives who left the firm and set up a rival investment management firm called Cytonn has been on and off for the last four years. Recently a judge ruled that a criminal case would continue in the courts. we could not agree to be part of actions such as illegally using client insurance funds to purchase shares of Britam to rescue a failed IPO, we objected to using insurance funds under our management to purchase a failing bank – a transaction that has now led to loss of billions of shillings of investors’ funds.. The suits were obviously malicious and designed to achieve only two objectives: first was to punish the former team for daring to leave as a team, and second was to deter competition. He writes that his statement was released was to reassure Cytonn’s 500 employees and 3,000 clients who had invested over Kshs 20 billion in various investment products. Both Cytonn’s managers and Britam have separately settled with Acorn that was a partner in the fund-raising plan before the dispute. EDIT/ Update October 12: The Court of Appeal granted stay orders on October 11, meaning there is no prosecution action against the four Cytonn executives for now. This entry was posted in Britak, Britam, Corporate governance, Cytonn, Kenya real estate, NSE insiders, NSE investor awareness on October 11, 2018 by bankelele.